Europe Must Now Show Solidarity with an Iranian Government that Faithfully Obeyed All the Rules We Drafted. It wasn’t just the news that the US had pulled out of the Iran Deal – that died when the White House opened its doors once again to John Bolton, a challenger to Kissinger’s status as the most unhinged sociopath in Washington history. It was the conditions drafted for a post-Iran deal world that really turned heads: that European, Russian and Chinese firms have 90-180 days to divest from Iran or meet the wrath of US financial penalties. Without the secondary sanctions which Bolton and co have threatened on Europe the US breaking the agreement means very little. US trade with Iran only came to about $200 million last year, whereas Iran-EU trade grew to represent €20 billion. EU exports to Iran grew at an annual rate of 31.5 percent and imports grew 83.9 percent during 2016-17. From 2013 to 2017, the annual growth rate for imports was a staggering 89.7 percent, and growth for exports was 18.7 percent. For a largely economically stagnating continent, the new Iranian market comprising 80 million people is a big deal. It’s important to make the distinction that the US did not formally withdraw from the JCPOA as most media outlets have lazily described it. The Iran deal is an agreement, not a treaty, and no mechanism for withdrawal is in place. The US simply chose to break the rules of an agreement they signed just three years ago. To bow to American economic threats would be to enable the undermining of international law and punish those who have played along with good faith. According to all independent research, and not just Benjamin Netanyahu’s mad drawings of cartoon bombs, Iran have adhered to all the terms of the agreement and thus don’t possess the means to launch a nuclear weapon, unlike Benjamin Netanyahu, who possesses the world’s third largest stockpile. Divesting from Iran as John Bolton is furiously demanding would be like awarding a gold star to the kid who spent all day screaming at the back of the class and making the swot who completed all his homework face the wall. It would represent a watershed moment in the dissolution of rational international relations in favour of bending over to a bully. The EU have stood up to an aggressive Trump administration once this year and they should do it again. It may carry risks, but the alternative is to throw away sovereignty. Conservative commentators argue that it’s ‘not worth starting a trade war with the US’; the reality is that we’re already in one. This is a political crisis, and demands a political solution. The EU could promise to compensate firms who face US fines through selectively lowering Iranian tariffs. The most obvious Hail Mary solution, however, would be to reintroduce a blocking statute against the sanctions, similar to the one used by the EU to continue trading with Cuba in the 90s. This would fire the starting gun for a full-on trade war, but the only other option would be to allow the sovereignty of Europe to be undermined and the US to take the seat of George Bush-era aggressive global dominance once again. The EU could cogently claim that their hand was forced, even if they choose to go down a ‘drastic’ route. Ultimately the only errant party in this affair is the US; they can go back on the agreement if they choose, but they have no right to set the document on fire. 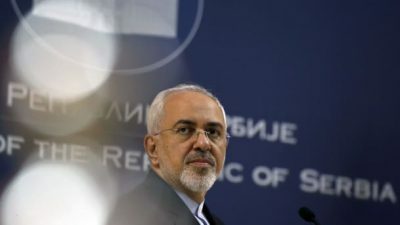 Iranian Foreign Minister Javad Zarif has indicated that if the EU can give decent reassurances on the continuation of EU trade then business could continue almost as normal. This whole affair could be reduced to a simple tantrum of a fracturing empire if the EU decide to show some steel.